Rev. Robert F. Cooney, CSV, who established the first library at Saint Viator High School and went on to direct one at Bishop Gorman High School, before ministering as a hospital chaplain and pastor, died Dec. 12, 2014. He was 87. Fr. Cooney was born Jun. 20, 1927 in Springfield, IL, the youngest of six children of William and Florence Fitzpatrick Cooney. He was preceded in death by his parents, his brothers: Bernard, William, John and Joseph and his sister: Sr. William Bernard, OP of Springfield, IL. He is survived by many nieces and nephews. His first introduction to the Viatorians came at Cathedral Boys High School in Springfield, where he graduated in 1945. He went on to earn a bachelor of arts degree in philosophy from St. Ambrose College, Davenport, IA, and a master’s degree in library science from Rosary College, River Forest, IL. He pronounced his first vows on Feb. 5, 1951, his final vows on Feb. 5, 1954 and was ordained a priest on June 9, 1957 in Techny, IL by Bishop William O’Brien. Fr. Cooney taught at Spalding Institute, Peoria, IL (1951-1953), St. James Trade School, Springfield, IL (1953-1954), and Alleman High School, Rock Island, IL (1959-1961). He was the first librarian at Saint Viator High School, Arlington Heights, IL (1961-1971), and later served as librarian at Bishop Gorman High School, Las Vegas, NV (1971-1973). At St. Viator Church in Chicago, he served as associate pastor (1973-1977). He serving as a hospital chaplain at St. John’s Hospital, Springfield, IL (1977-1981) and St. Mary’s Hospital, Kankakee, IL (1981-1986). 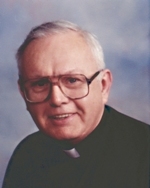 He returned to pastoral work, when he served as parochial vicar at Maternity of the Blessed Virgin Mary Church in Bourbonnais,(1986-1990), and at Guardian Angel Cathedral in Las Vegas, from 1990 until his retirement in 1996. While in retirement in Las Vegas, Fr. 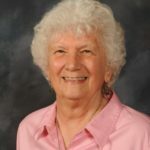 Cooney continued to serve at the Cathedral on weekends. In 2005, he moved to the Province Center retirement residence before moving in 2011 to Addolorata Villa. Visitation took place Dec. 16 before the Rev. Thomas von Behren, CSV, celebrated a Mass of Christian burial, both at the Viatorian Province Center chapel. Interment was at Queen of Heaven Cemetery in Hillside, IL. Please keep Fr. Cooney in your Masses and prayers.